Have you ever had a post that did better than you thought it would? Or on the other hand, have you ever put lots of work into a social post that flopped? Sometimes it’s hard to understand why posts perform the way they do. As you work to create high-quality and engaging content for your audience, you may be overlooking one simple factor: timing. High engagement often comes as a result of the right post at the right time. While I can’t create your content for you, I can offer some insight into what times your content might perform best. Let’s look first at general recommendations from industry leaders, then dig deeper into your audience in particular. All of the above conclude that weekdays around midday are the most ideal times for reach and engagement. HubSpot also found that the weekends before 8am and after 8pm were the worst times for posting. You’ll find a few helpful stats here. 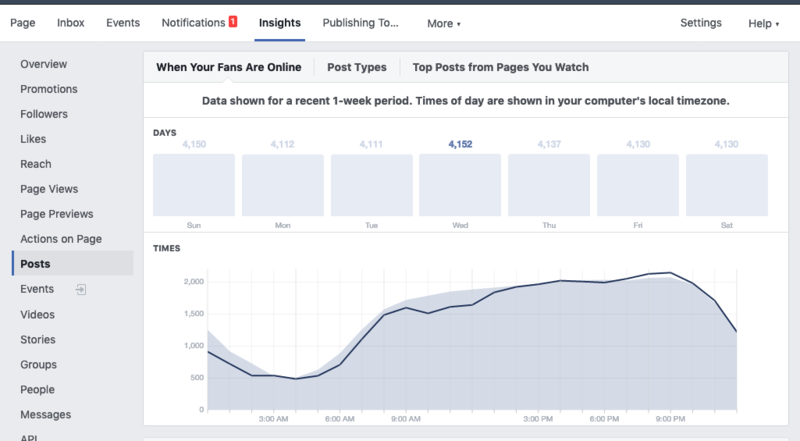 The first graph will show you what time your Facebook fans are online the most. The graph shown here is a weekly average, while you can view each specific day’s stats by hovering over the small squares. Keep in mind that this stat only shows data collected from the past week, so you’ll want to keep an eye on it as it may change over time. You now have a general idea of when most people are active on Facebook. You even have an idea of when your people are active on Facebook. But when are they engaging? And with what type of content? A simple way to find this out to track it for yourself (note: simple does not mean fun or quick!) The easiest way to do this is with a standard Excel/Google Sheets document. Track the type of content you post, when it was posted (day and time), and the total reach/engagement. This will require a consistent investment over a long period of time, but will be a big help in planning your future social content strategy. It’s important to note that if you aren’t producing high-quality relevant content, it probably won’t matter what time you post it. But if you’re looking for ways to engage your community effectively with your content, posting it at the right time might just be the small change you need.